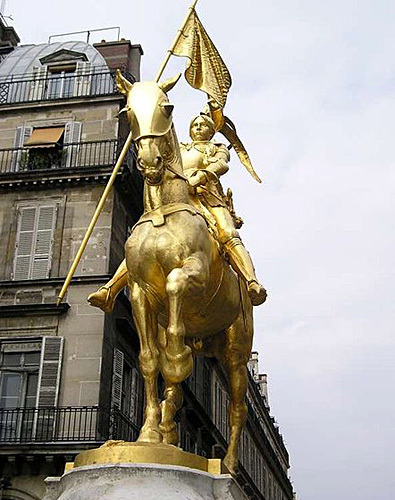 The statue above of Joan on horseback is located in Paris however Joan of Arc herself never entered the city because the assault she launched on September 8, 1429, failed and Charles VII intervened the next day to stop any further attempt to liberate Paris. Joan as always fought heroically and had to be forcibly removed from the battlefield after she was wounded in the thigh by a bolt from a crossbow. The following accounts of what transpired at Paris on September 8, 1429 are by Perceval de Cagny who was present on the field of battle and by Clement de Fauquemberque, a Burgundian inside Paris at the time of the attack. "On Thursday, Day of Our Lady, eighth day of the month of September, 1429, the Maid, the Duke of Alencon, the Marshals de Boussac and de Rais, with a great number of soldiers and archers, left at about eight in the morning from la Chapelle , near Paris, in fine order; some to give battle, the others to support those who would make the assault. The Maid, the Marshal de Rais and Sire de Gaucourt, by her order went to deliver the assault at Porte St. Honore. The Maid took her standard in her hand, and with fhe foremost entered the fosses near the Swine Market. The assault was severe and long, and it was marvelous to hear the noise of the cannons and culverins that those directed on those without, and from all manner of shafts, so thickly planted as to the seem innumerable. And though the Maid and a great number of knights descended into the fosses, with others on the borders and near by, very few were wounded. Many of those on foot and horse were struck down by stone cannon-balls; but by the grace of God and the fortune of the Maid, never a man of them died, nor was so wounded that he could not return at his ease to his camp without other aid. The assault lasted from about the hour of noon until near dusk. And after sunset the Maid was stuck in the thigh by a bolt from a cross-bow. After she was struck, she insisted more strongly than ever that the soldiers should attack the walls, and that the place would be taken. But because it was nightfall and she was wounded, and because the soldiers were weary with the long assault they had made, the Sire de Gaucourt and others came to take the Maid, and against her wish carried her from the fosses. And thus failed the assault. And she had very great regret thus to depart, saying: 'By my staff, the place would have been taken!' They placed her on a horse and conducted her to lodging at la Chapelle and all the others of the King's company, with the Duke of Bar and the Count of Clermont, who this day come from St. Denis." "On Thursday, September 8, the Feast of the Nativity of the Mother of God, the soldiers of Messire Charles de Valois assembled in great numbers near the walls of Paris, at the Porte Saint Honore rather hoping by a popular tumult to oppress and injure the town and the inhabitants, than to succeed by force of arms. About two hours after noon they began to make a semblance of an intention to assail the place. Hastily did some of the enemy at the swine-market and near the gate bring up long bourrees (bundles of wood) and faggots, and throw them into the outer trenches, which were dry; next into the ditches close to the walls, where the water was high." (Either there had been a flood, or the managers of the sluices had admitted a full current of water from the Seine.) "At this moment the disaffected or bribed people in the town raised shouts throughout the whole place on either side of the bridges, yelling that 'all is lost, that the enemy has entered ' : with cries of Sauve qui peut! "Thereon all the people in the churches at sermon were panic- stricken, and most of them fled to their houses and shut the doors; there was no other commotion. Those who were appointed to that duty stayed on guard on the walls and at the gates, and others, coming up, made strong and good opposition to the men of Charles de Valois, who remained in the outer fosse, and without, at the swine-market, till ten or eleven o'clock, when they departed with loss, several of them being slain or wounded by gun shot and arrow shot. Among others a woman called the Pucelle, who was one of the leaders for Charles de Valois, was wounded in the leg by an arrow. The plan of the leaders was rather to injure Paris by a commotion within, than by armed assault for had they been four times more numerous than they were, or more, they could not have taken the place either by storm or siege, for it was well supplied with food, and the townsfolk and garrison were perfectly at one in the resistance, as it was reported that Charles de Valois had given up the place to be sacked, ordered a massacre of men and women of all ranks, and would plough the site of a town of Christian people, a thing not easily credible."